After 1919, the Saarland and its approximately 800,000 inhabitants came under French control under a League of Nations mandate. The Versailles Treaty stipulated that a popular referendum was to be held fifteen years later to determine the region's future. The Nazi propaganda machine ran at full tilt in the lead up to the referendum, which was scheduled for January 13, 1935. The regime organized countless rallies and mass events to convince voters of the absolute necessity of erasing the "shame of Versailles" and bringing the Saarland "home to the Reich." Over 90 percent of eligible voters approved the annexation of the Saarland to the German Reich, and on March 1, 1935, it was officially incorporated into the nation as the Saarland District. For Hitler, the Saar vote was a great source of prestige and proof of the power and popularity of the Nazi regime. The ballot for the Saarland referendum is reproduced below. The header reads: "Referendum Committee of the League of Nations." 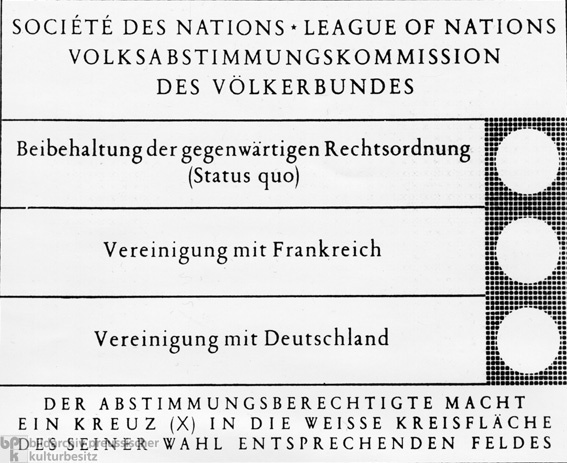 Voters had three options to choose from (top to bottom): Maintenance of the present system of law (status quo), Union with France, or Union with Germany. Voters were instructed to mark their choice with an X.